KUWAIT CITY, July 31: A total of 97 undocumented Overseas Filipino Workers (OFWs) in Kuwait were repatriated on Sunday night to the Philippines on board Gulf Air as part of the ongoing mass repatriation of overstaying Filipinos under the Assisted Voluntary Repatriation Program (AVRP) by the Kuwait government in cooperation with the Philippine Embassy in Kuwait. 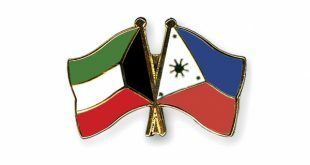 The Assisted Voluntary Repatriation Program, a mutual agreement signed between the Kuwait government and the Philippine Embassy in Kuwait seeks to address the rising number of illegal expatriates in Kuwait. 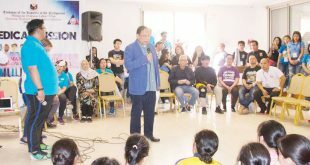 “The repatriation of undocumented OFWs continues and we would like to thank the Ministry of Interior, the Kuwait Immigration Department for initiating this program and for helping the embassy under the leadership of Ambassador Renato Pedro Villa,” stated Assistance to Nationals Unit (ATNU) Officer at the Philippine Embassy Francis Baquiran who was joined in by other ATNU staff to oversee the repatriation of the undocumented OFWs. The 97 repatriates under the AVRP did not have to pass through the ‘Talha’ or deportation centre but were transported from the embassy shelter in Hateen directly to the airport where they were accompanied by the embassy’s Assistance to Nationals Unit (ATNU) team and Kuwait Immigration officials who assisted them at the airport check-in counter. 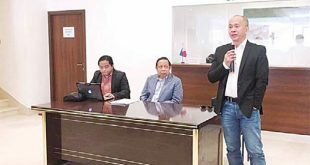 Most of the undocumented OFWs worked as Household Service Workers (HSWs) who left their employers after experiencing various forms of maltreatment such as physical, verbal or sexual abuse, non-payment of salaries, lack of food and overwork. 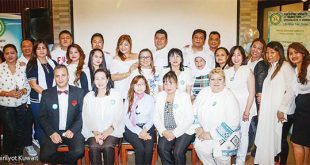 The repatriates thanked the Kuwait government and the Philippine Embassy for processing all their travel documents. “I’m very thankful that finally after my harrowing experience here, I can be with my family now,” stated Noura, who experienced physical abuse from her female employer. Others who have filed a case against their abusive employers were also among those who went home on Sunday. “I’ve been waiting for the result of my case against my employer but the embassy lawyer told me that my next hearing will be in Nov 23 yet. I’ve been staying in the embassy shelter for more than a year now. I cannot wait any longer and suffer the same fate like those who went home with unresolved cases. I have lifted everything to God and hopefully justice will prevail. Right now, I just want to be with my family,” stated Almira who suffered three years of torture from her female employer who beat her with a steel and burned her back, legs, arms and hands with a flat iron. She endured this maltreatment for three years until she was able to escape and reach the Philippine Embassy shelter in June last year. 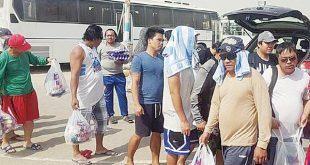 The repatriation with no detention under the AVRP continues, hence, the Philippine Embassy urged all undocumented OFWs in Kuwait to take advantage of this and go home to the Philippines. 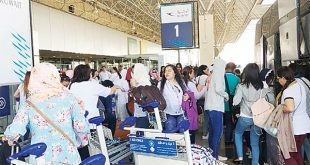 All those who want to go home may enlist at the embassy shelter in Hateen for the processing of their travel documents and clearance. The embassy shelter is located at Block 2, Street 217, Villa 42, Hateen area or they may call the embassy hotlines +96598005115/+96569902264 for all the requirements under the AVRP.